The US Department of Education's Expert Review Panel met on March 12 for their annual review of new products. The group, chaired by Dr. Cay Holbrook, reviewed six 2012 products: Braille Plus 18™, Getting to Know You, Tactile Town, Giant Textured Beads with Pattern Matching Cards, Turtle and Rabbit, and VisioBook. On March 9th APH Research Department Technology Programmer Ken Perry and APH Business Manager Chris Prentice attended the Texas Instruments “Teachers Teaching with Technology” Conference in Philadelphia. Ken and Chris attended in association with the development of the upcoming APH Orion TI-84 Plus Talking Graphing Calculator based on the TI-84 calculator platform. In addition to attending sessions, Ken and Chris had the opportunity to meet the original developers of the TI-84 Calculator and Melendy Lovett, Senior Vice President of Texas Instruments. The evening was capped off with a reception attended by Dr. Mayim Bialik, who stars as Dr. Amy Farrah Fowler on "The Big Bang Theory," and is a real-life neuroscientist and spokesperson for the TI-Nspire. Along with Venkatesh Chari of Orbit Research, Ken and Chris had the opportunity to spend 10 minutes in private with Mayim discussing the Orion TI-84 Plus Talking Graphing Calculator. Mayim was so impressed with the embossed graphs generated by the calculator that she kept several for herself! In a lighter moment Ken shared with Mayim that he recalled watching her on TV as Blossom before losing his sight—indicating that she “still looked the same.” With a laugh Mayim quickly confirmed that she did indeed still look the same! APH is proud to announce a major software upgrade for Braille Plus 18™. Increases the size of file that the Word Processor handles from 250 KB to 1.5 MB. Dramatically increases battery life both during use and on standby. Improves the accuracy of optical character recognition by swiching to a fixed focal length of about 12 inches. Improves Word Processor compatibility with Microsoft Word files. Adds a problem reporter tool to help developers increase reliability and performance. This is a free upgrade for all Braille Plus 18 users. Attention TVIs and Science Teachers! Field testers are needed to evaluate the prototype of the Protein Synthesis Kit, an interactive model used in conjunction with the upcoming APH DNA-RNA Kit! is fully adapted for students with low vision or blindness. Prototypes will be available for field testing in May 2013. The APH Physical Education Website provides links to help teachers and parents understand the recent federal guidelines to provide athletic opportunities for students with disabilities, including visual impairment. Visit the PE Advocacy Page to learn more. APH is currently seeking field evaluators for the Tactile World Globe, an update to the existing APH globe that incorporates high-relief topography, braille labels for continents and oceans, labeled latitude and longitude lines, a prominent equator, and discernible International Date Line and Prime Meridian. The project leaders, Karen Poppe and Tom Poppe, are seeking feedback from current users of APH’s existing tactile globe to compare and critique the presentation of the Northern Hemisphere before further tooling of the Southern Hemisphere is undertaken and finalized for production purposes. The field evaluation will be brief, with feedback needed by the end of May. Evaluators will be allowed to keep the prototype after satisfactory completion of the evaluation packet. Evaluators will be asked to a) use the prototype with as many students as possible within the given timeframe, b) complete a product evaluation form, and c) report student outcome data. Field test sites will be selected based upon geographic location, type of setting, and the grade levels/ages of the students. If you are interested in possibly serving as a field evaluator and you have access to APH’s current tactile globe, please provide the following information: name, title, school/agency, complete contact information (phone number, mailing address, email address), expected number of students, and the educational levels/ages of your students. Send this information to Karen J. Poppe, Tactile Graphics Project Leader, kpoppe@aph.org, by April 15, 2013. You may also contact Karen at 502-899-2322 or 800-223-1839, ext. 322. 1st Place—Congratulations to Dietrich, a student at North Dakota School for the Blind. Dietrich proves that he is the go-to person for all your questions about the APH Portable Sound Source – Sport Edition! His comprehensive presentation on this versatile product garnered his first place winning! What are you going to do with your $150, Dietrich? 2nd Place—Quincie, also from North Dakota School for the Blind, demonstrated her mad braille skills in the second-place winning video featuring the Janus Slate, Saddle Stylus and Spiral Notebook. A $75 check is on its way to her. Congrats, Quincie! 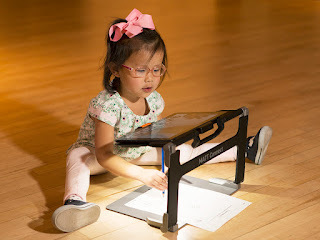 3rd Place—Congratulations and $50 go to third place winner, Katie, of the North Dakota School for the Blind, who showed us how she uses APH Word Playhouse in conjunction with her braillewriter! You go, Katie! Put your hands together and give a hearty cheer for these talented individuals! Thanks to everyone who sent us an entry. Be on the lookout for the Spring 2013 contest to begin soon! To see the winning videos and all the contest videos, head over to www.aph.org/contest. You can access the complete User's Manual and a free demo of the Teacher's Pet software from http://tech.aph.org/tp_info.htm. Click the Download link at the top of the page to download a demonstration version of the program. New Faces in Resource Services and Research Departments! The Resource Services Department is pleased to announce the addition of a new Special Collections and Cataloging Librarian: Emmy Malinovsky. Emmy earned an MLS from Indiana University at Indianapolis and has nine years of professional experience in academic libraries, including Ivy Tech Community College. Emmy will assist with cataloging materials for Louis and the Migel and Barr libraries, in addition to providing reference services. The Research Department’s Technology Group welcomes programmer Bryan Enders. Bryan comes to us with enthusiasm and great ideas. He is an iOS developer, which means he writes software for iPhone, iPad, and iPod Touch. He will be expanding the apps APH provides to blind and visually impaired students and teachers and parents who know that education includes the digital arena as well as the traditional paper methods of years past. The Getting In Touch With Literacy conference will be celebrating its 20th anniversary at the 2013 Getting In Touch With Literacy conference, December 4—7 in Providence, Rhode Island. This event, the premier literacy conference for individuals who are blind and visually impaired, will feature presentations, exhibits, poster sessions, pre-conference workshops and more, all designed to promote literacy skills for children and adults. The conference has a tradition of outstanding presentations by practitioners in the field, and the call for papers for 2013 is now live! It can be found on the Getting In Touch With Literacy website, at www.gettingintouchwithliteracy.org. Deadline for submission is May 15, 2013. Check out the online submission form and share your great ideas, good experiences, and awesome innovations with your colleagues. Catch the wave and come join us in December! APH staff were on hand to corral attendees at the recent Kentucky AER conference in Cadiz, KY. The conference, held March 13 - 15, at Lake Barkely State Park, drew around 100 participants from across the state. A very full agenda included a pre-conference NIP event hosted by APH and featuring Californians Nita Crow and Stephanie Herlich, who presented on the APH product Getting To Know You. Also on the agenda were presentations on liability and insurance, cane repair, braille instruction, transition programs, the Anne Sullivan Macy Act, and more. Some favorite APH products in the exhibit hall included Getting To Know You, SAM, Early Braille Trade Books and the Tactile Tangrams kit. Congratulations to APH Graphic Designer Stephanie Lancaster, winner of a KAER STAER Award! Director of Field Services Janie Blome approved a National Instructional Partnership event to be conducted prior to the beginning of the 2013 KAER annual conference at Lake Barkley State Resort Park, Cadiz, Kentucky. The NIP event, Getting to Know You: a Social Skills/Ability Awareness Curriculum, took place on March 13, 2013, and some thirty individuals attended and participated. Getting to Know You: a Social Skills/Ability Awareness Curriculum, addressed the social skills area of the expanded core curriculum. The product became available for sale on quota in September, 2012. The co-authors of the product, Nita Crow and Stephanie Herlich, traveled to Kentucky from the California School for the Blind in Fremont, California, to provide the four hour training session. Participants got to experience doing activities using blindfolds or simulators to gain experience in doing these activities with a visual impairment. The participants gave the two presenters the highest rating possible and indicated they learned a lot and had fun doing it. Field Services Representative Monica Turner attended the second annual West Virginia Regional Braille Challenge on March 22 in Romney, WV, to exhibit APH products. The Braille Challenge® brings together kids, families and professionals for a fun day of celebrating braille literacy. 23 students participated in this event, and there were approximately 50 teachers and family members who also attended and visited the exhibit. The younger students greatly enjoyed having some time to explore Tactile Town: 3-D O&M Kit, the older students were especially excited by the new Braille Plus 18 with its refreshable braille display, and the VisioBook electronic magnifier and distance viewer was a huge hit among students of all ages. Congratulations to all of the West Virginia students who participated in this event, as well as the students who have participated in the other regional preliminary events that have taken place this year across the U.S. and Canada. From the Migel Library: Lockett, Jack. A Blind Man’s Experiences and Adventures in Crossing the Country 3,000 Miles on a Bicycle. After losing his sight in 1920, Jack Lockett decided to ride a tandem bicycle across country to gain publicity and funding for a procedure to have his eyesight restored. Beginning the trip in Dallas, Texas, Jack and his son rode to Rochester, Minnesota to be evaluated at the Mayo Clinic. The doctors at the clinic told Mr. Lockett that his vision loss was due to glaucoma, and that the doctors and the Clinic could do nothing for him. Having been so impressed by the experience, however, Jack decided to make a second trip to New York to consult more specialists. Although he was again told that doctors could not restore his eyesight, the adventures he had experienced gave him a determination and patience that he never would have had otherwise. This rare and fragile pamphlet has been digitized for the Internet Archive, and is available at http://archive.org/details/blindmansexperie00jack. Participants from across the globe gathered in Japan for a 1979 exhibition of tactile picture books. Believed to be the first of its kind, it was far more successful than had been anticipated, with an estimated 85,000 visiting the exhibition in one of the 4 cities to which it traveled. Fifty exhibitors presented 353 tactile picture books and toys to a very engaged audience. The enthusiastic response of attendees, in addition to the 1,663 surveys that were returned, allowed for some valuable conclusions to be drawn by producers. One of the more surprising conclusions was that, at the time, most visually impaired children and adults had never encountered tactile picture books before. The diverse audience also reinforced the idea that tactile books can be a unique and valuable product of their own, rather than just a replacement for printed material. APH project leaders, Burt Boyer (Early Childhood) and Suzette Wright (Emergent Literacy), traveled in early March to take part in the International Preschool Symposium. This year the Symposium was hosted at the New Mexico School for the Blind and Visually Impaired Albuquerque campus, site for the Early Childhood Program and Outreach Program. EOT Linda Lyle, Superintendent of NMSBVI, welcomed the group of about 40 individuals from across the country and Canada--TVI’s, administrators of preschool programs, teacher trainers, doctoral students, and an ophthalmologist--all with a focus on children with visual impairments and children with multiple disabilities and visual impairments, birth through kindergarten. VIPS (Visually Impaired Preschool Services) was well represented at the meeting as Kathy Mullens, Director of Education, and Rebecca Davis and Ann Hughes from VIPS@Bloomington attended and did not hesitate to participate. Following updates from the field, focused small group discussions were held on a variety of topics: outreach, service guidelines, braille standards for early childhood and the Common Core, Babies Count, and updates to DVI position papers. One of the discussion groups focused on how to continue the Babies Count Project. APH made the decision three years ago to no longer coordinate the project. Two meetings were held by the discussion group, and there was no doubt those participating want this project to continue. Additional information on how this will happen will be shared in the future as there is a task force assigned to work on this issue. The group closed after two and a half days with reports from the “work groups” and a presentation on optic nerve hypoplasia by ophthalmologist Dr. Mark Borchert (Children’s Hospital Los Angeles). In addition to full day meetings, evenings out with the group provided the opportunity for additional discussion over Southwest cuisine—“the whole enchilada”! A tour of the impressive facilities at the Preschool was enjoyed by all. And last but not least, Burt’s birthday arrived, allowing everyone to wish him “feliz cumpleaños” and share a tres leches cake made by an NMSBVI staff member. Now that’s hospitality! An APH-Rich Experience in Richmond, VA! Kerry Isham, Field Services Representative gave a presentation and also exhibited products at the 2013 Virginia AER Conference held in Richmond, VA from February 27 through March 1. In keeping with the conference theme, “Putting on Your Top Hat – The Many Hats We Wear” Kerry’s presentation was entitled “Put on Your Director’s Beret: Using Video as a Teaching Tool.” It addressed how to use video production in the classroom, and featured student-made videos about such APH products as The Hundreds Board, The Tactile Graphics Kit, Azer’s Interactive Periodic Table of the Elements Kit, Feel ‘n Peel Stickers, Word Playhouse and the Color Test. Attendees reported being entertained and inspired by the multimedia session. Many of the participants also stopped by the APH booth to check out more products such as Best for a Nest, MathBuilders – Unit 5, Sense of Science – Astronomy, and TREKS. Hats off to Virginia for providing such a rich conference experience for all who attended! On March 4th, field services representative Kerry Isham presented to two very enthusiastic groups of staff members at Philadelphia’s Overbrook School for the Blind Staff Development Day. The first presentation was on the APH Intervention Continuum – which includes The Sensory Learning Kit (SLK), Symbols and Meaning (SAM) and Tactile Connections - addressing the systematic development of nonverbal communication for students who are blind and visually impaired and may also have other disabilities. The second session examined the APH product, Building on Patterns, which helps teach primary-level students reading, writing in braille, and spelling. At the end of the presentations, the groups took part in Jeopardy-type games that tested their knowledge of these products. Prizes were awarded to the winning teams. Everyone’s eager participation helped make these presentations interesting, useful and enjoyable. Staff members Nancy Lacewell, Adam Clark, Kerry Isham, Dena Garrett, Janie Blome, DeAnna Morrison, and Linda Turner all attended and helped exhibit APH’s wares at the 2013 California Transcribers and Educators for the Blind and Visually Impaired (CTEBVI) Conference, which was held in San Francisco, CA on March 15th and 16th. Nancy, Linda, and Kerry were also on the agenda to present workshops. The convention drew over 300 attendees, many of whom made it a point to stop by the APH booth to try out products that included Turtle and Rabbit, TREKS, the APH Light Touch Perkins Brailler, The Impressor, Giant Textured Beads and Pattern Matching Cards, Life Science Tactile Graphics, and the Number Line Device. The event was full of information and fun, and APH was glad to be a part of it! Twenty five students, teachers, parents, and para professionals participated in a fun and engaging activity February 28 hosted by Teri Ritchie, Kentucky School for the Blind Regional Consultant, Northern Kentucky Cooperative for Educational Services. The day’s focus was on recreational and leisure activities as well as opportunities to socialize with others from their region. Cathy Johnson, APH Field Services Representative, was on hand to actively take part in the day’s events. Participants were provided opportunity to become acquainted with a variety of APH products for recreation and leisure time. Games such as Web Chase, Treks, Touch 'em All Baseball, Termite Torpedo, and Armadillo Army were a few of the favorites engaged throughout the day! Other sports-related products were on display as well and students had a brief opportunity to experience using them. Students and teachers appreciated the opportunity for hands-on participation and thoroughly enjoyed the day! Twelve students and faculty from the Western Michigan University personnel preparation program visited APH on March 22. The students, most of whom are in the rehabilitation teaching program, were welcomed by APH President Tuck Tinsley, and then learned about APH history before a tour of our facilities. They met with key APH staff and learned about the functions and projects of many APH departments. Presentations also included information on the Federal Quota process, the APH website and data bases, and other services provided in support of our products. Students were able to get first hand experience with several of those products during meetings with Project Leaders from the Research Department. We always welcome visits from university personnel preparation programs. If you are interested in bringing your students, please contact Janie Blome, jblome@aph.org. End of an Era: Patterns Revision Is Complete! Congratulations to everyone who made the Patterns revision possible! The massive project of reworking APH’s flagship Patterns reading series is now complete! The release of the Building on Patterns Second Grade Reference Volume completes the revision of the classic Patterns Primary Braille Reading Program. Work has already begun on again revising Patterns, beginning with BOP, Second Edition: Pre-Kindergarten and Kindergarten Level. Last October during APH Annual Meeting, APH’s Eleanor Pester (retired) and the BOP writers were honored for their countless hours of work with the Extra Mile award. We would like to again thank all of those in the field and at APH who worked so hard to make the BOP series available! We have published our latest corporate Annual Report, Fiscal Year 2012, which contains a wealth of information related to our previous fiscal year, October 1, 2011—September 30, 2012. The report contains such items as an executive summary by president Dr. Tuck Tinsley, a photo memory album from Annual Meeting 2012, the reports of the Ex Officio Trustee Advisory Committees, data concerning the distribution of students eligible for Federal Quota funds and the agencies that receive Quota funds, and APH Development Department information. We’ve added links to several additional videos created by talented student Chase Crispin and his teacher LeAnna MacDonald. Visit our products video page to view these videos, which cover several aspects of our Braille Plus 18 notetaker. Did you know that APH is on Flickr? We are in the process of uploading images of recent events and products to our Flickr page: http://www.flickr.com/photos/aphblind. Feel free to comment on the photos or share them on Facebook and Twitter, and check back soon for even more great photos of what's happening here at APH! This abacus introduces visually impaired students to early math concepts and number operations, as well as abacus terminology. It supports concepts and skills such as one-to-one correspondence, number meaning, addition, and subtraction. It also lends itself to preparing a young student for the Cranmer Abacus. The Expanded Beginner’s Abacus consists of a black frame with 3 rods. Each rod has 9 white beads that slide against a red felt backing. The red felt background provides a good visual contrast and prevents beads from slipping. The simple design of the Expanded Beginner's Abacus allows for direct representation of a given value and enhanced readability for "little fingers". Measures 5.37 x 3.25 x 0.75 inches. Hook/loop materials are provided for connecting multiple abacuses together, in order for students to complete computations that involve amounts of money or numbers too large for the EBA. Print guidebook included. Braille guidebook available separately. Recommended ages: 5 to 7 years. The APH EZeeCOUNT Abacus is specially designed with two textured beads (smooth & rough/wavy) and a large frame to accommodate the needs of students who are blind and visually impaired. This abacus consists of a 10 x 10 grid of flat beads. The beads can be flipped and distinguished by color and/or texture. The red beads are wavy/rough and the yellow beads are smooth. Each row of beads slides along an elastic band from left to right. The reverse side is a dry-erase board, which allows students to write math problems, draw pictures, play games (e.g., Tic-Tac-Toe), and more. The included instruction booklet provides examples of how the EZeeCOUNT Abacus can be used in a variety of ways. A Punnett square is a diagram that is used to predict the outcome of a particular genetic cross or breeding experiment. It is used by biologists to determine the probability of offspring genotypes. The Punnett Square is a visual representation of Mendelian inheritance. The 4-Box Tactile Punnett Squares allow your students to predict offspring genotypes and probabilities for one character from the known genetic makeup of two parents; for example, a monohybrid cross or a test cross. Each of the four boxes of the Punnett Square easily accommodates four braille cells across. Two 4-Box Punnett Squares are printed and embossed on heavy 8.5 x 11 inch paper, 25 sheets per re-sealable envelope. The 16-Box Tactile Punnett Squares allow your students to predict offspring genotypes and probabilities for two characters from the known genetic makeup of two parents; for example, a dihybrid cross. Each of the 16 boxes of the Punnett Square accommodates eight braille cells across. One 16-Box Punnett Square is printed and embossed on heavy 11.5 x 11 inch paper, 25 sheets per re-sealable envelope. Guide for high school students with disabilities and the adults in their lives. Provides advice on transitioning from teen years to adulthood and from high school to college or the workplace. Covers handling medical issues without parental assistance and creating a paper trail to document the disability. Bethanne, and her daughter join Bethanne's former mother-in-law Ruth on a cross-country road trip to Florida. Ruth heads for her fiftieth high school reunion while Bethanne considers her ex-husband's wish to reunite. Along the way Bethanne falls in love. Quartet of dark novellas includes 1922, in which a Nebraska farmer enlists his son to help him kill his wife when she wants to sell the farm. In A Good Marriage a woman discovers her husband's darker side while he is away on a business trip. Adult Reader. Some violence and adult content. Bestseller.